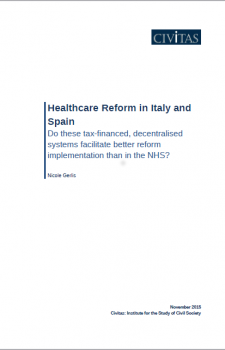 Civitas: Institute for the Study of Civil Society Healthcare Reform in Italy and Spain: Do these tax-financed, decentralised systems facilitate better reform implementation than in the NHS? The NHS is under unprecedented strain. When looking for solutions, stakeholders often compare the NHS with Bismarckian social insurance healthcare systems in Europe rather than other Beveridgean tax-financed systems. This report studies the Italian and Spanish healthcare systems, which are of the latter type and operate more similarly to our own.